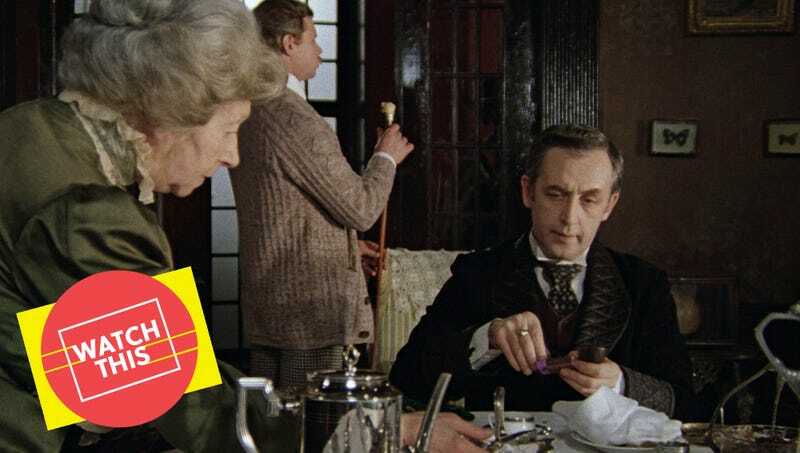 The dark horse of Sherlock Holmes adaptations, the Soviet TV series The Adventures Of Sherlock Holmes And Dr. Watson offers one of the most inspired takes on the Arthur Conan Doyle canon on the big or small screen, at once faithful and charmingly eccentric. Its portrayal of the relationship between Holmes and Watson (or “Vatson,” a pronunciation that rolls off more easily in Russian) is unrivaled; its editing of Doyle’s stories is often ingenious, based on a deep appreciation for the original text. (Among other things, it includes the single creepiest Moriarty in film or TV and the only version of “The Speckled Band” to address the story’s notorious internal errors.) But mostly, it’s just fun and delightfully watchable, qualities which have made it a popular cultural touchstone in the former Soviet Union and a cult favorite of Holmesians beyond the Eastern Bloc. The two-part “The Hound Of The Baskervilles,” an exceptional adaptation of one of Holmes’ most famous cases, showcases the series in all of its delights and idiosyncrasies: Igor Maslennikov’s deceptively simple direction, with its quintessentially Russian affinity for the absurd and the gloomy; Vladimir Dashkevich’s terrific, eclectic score and hummable main theme; the quirky period atmosphere, with dark interiors and locations around St. Petersburg (then still called Leningrad) and Riga doubling for Victorian London; the loving shots of breakfast spreads; the offbeat supporting characters, most notably Sir Henry Baskerville (Nikita Mikhalkov, a glazed ham who later directed the Oscar-winning Burnt By The Sun), who wears a Yeti-sized fur coat and fidgets like a used car salesman. But the most obvious part of its appeal lies in its atypical, lovable Holmes. Although he often dons a deerstalker, Vasily Livanov is unlike any other major actor to portray Baker Street’s most famous resident; short in stature, with an unmistakable hoarse voice, his sleuth is mischievous, sly, and surprisingly affable, but still has the intensity and moodiness of Doyle’s creation. (It should come as no surprise that Livanov had a major side career voicing cartoon characters.) Vitaly Solomin’s Watson, in the meantime, is arguably the definitive reading of the character: capable, curious, courageous, and central to plot. True to its title, The Adventures Of Sherlock Holmes And Dr. Watson treats the duo as co-protagonists, giving them equal screen time. Through tricky cases of murder, it paints a warm portrait of friendship. Availability: Every episode of The Adventures Of Sherlock Holmes And Dr. Watson is available for free on Lenfilm’s YouTube channel with optional English subtitles. The series can also be obtained on DVD from Amazon or possibly your local video store or library. The complete “The Hound Of The Baskervilles” is embedded below.